It was a significant improvement from last week. THE CASEY Demons returned to its devastating best downing North Melbourne by 54 points at Casey Fields on Saturday. Casey Demons 18.11 (119) defeated North Melbourne 10.5 (65). 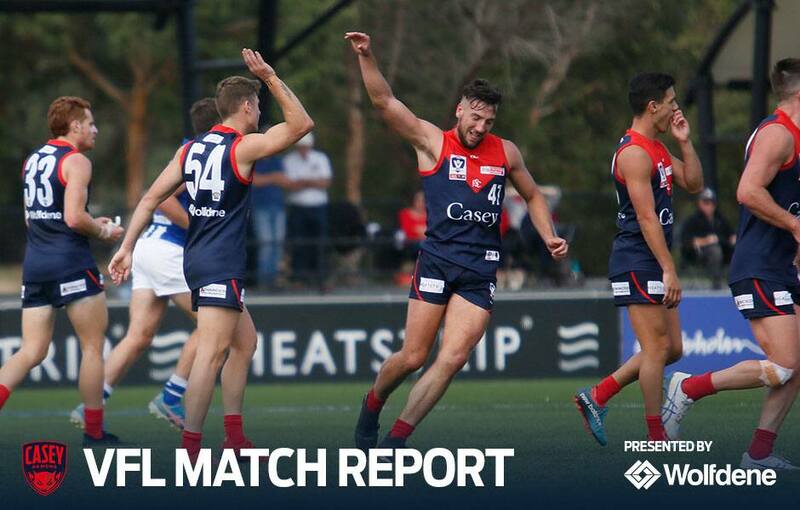 An inspiring effort by Jeff Garlett sparked a first quarter surge where the Demons held North scoreless leaving the opposing side shell-shocked. Working his way back from a shoulder injury, Garlett was best on ground. Pressuring the ball all game and booting three goals, Garlett’s name will be thrusted back in to the selection mix for Melbourne’s game on Saturday. Head coach Jade Rawlings praised the AFL veteran for his stellar play. “Jeffy was one of our best players today,” Rawlings told Melbourne Media. “He didn’t put his best foot forward last week, but he took ownership of that. After a tough week on the training track, the Demons came out firing from the first bounce. Pressuring North into costly turnovers and suffocating the Kangaroos defence, trapping the ball in Casey’s forward fifty. The relentless pressure led to goal scoring plays contributing to the tremendous victory. Rawlings credited his team for responding to a tough week of training. “We had 20 tackles in our forward fifty for the day,” Rawlings said. Casey dominated in every facet of the match, and made it count on the scoreboard finishing with nine individual goal kickers. Casey captain Mitch White was another standout in the one-sided performance, impacting marking contest in the forward fifty, and kicking three goals. After a lacklustre performance to open the season, the Demons looked to be back to their best this week. Corey Maynard had a team-high 22 disposals, and Mitch Gent had 20 touches and booted a goal, to lead the Demons. Tom Sparrow played a great team game tagging North playmaker Dom Tyson, pestering him all day and influencing the effectiveness of his disposals drawing praise from the coach. “We thought it would teach Tom really well, playing on a good inside mid like Tyson … I think Tom learnt a lot,” Rawlings said. Players bounced back quickly after a lengthy delay in the third quarter after Mitch Rodd from the Kangaroos, suffered what looked like a head knock after a tackle and was stretched from the ground. The Demons will have the Easter weekend off, but will return to face Richmond at Casey Fields, on Saturday April 27 at 2:00pm.